Marc Lange and Pierre de Villers (Cape Town) swam out together at Chakas Rock in Umtentweni this morning. The excitement in Marc’s call about the shad he just shot didn’t really give us a clue as to it’s sheer size. Almost couldn’t look at it when he hauled it out of the car! 8.7kg’s! Thought it was a garrick! 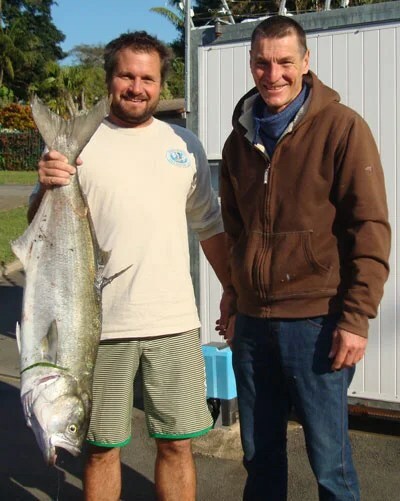 Pierre shot two nice Baardman, and Marc also bagged a tasty little Queen Mackeral…they saw a shoal of kob / daga salmon…it’s not often the water is clean enough to dive the Chakas area…talk about making the most of it! The shad had a karanteen trace hanging out of it’s mouth and was one in a whole shoal of giant shad like this one. Imagine the guy who was fishing for kara’s when this beast took his bait! For more information on catching shad on the South Coast, buzz Sean on umzimkulu@gmail.com. Or check out http://thesardine.co.za/mydo/ to read all about catching shad. ← Some very good reading…The Lazarus Bank!